I salute the forefathers and torchbearers of independent art and music. Once, I mistakenly let the reigns go on the common sense of independence. Today, I try my best in heeding my Father’s advice to “be your own boss.” In the arts, and in life, you eventually find that you aren’t really in control of anything but the quality of your work, and even that can get dicey when there are too many cooks and not enough perspective. A career can and will slide quickly if you are not doing quality work and you lose perspective on what you are doing this for. Purpose and care for your craft will bring more opportunity. I say put your head down, do the work, don’t mind the fluff and noise, keep on your path, work daily on your songs, writing, and art, so that you might later hold your head high and help others do the same. This most recent album of mine, PACO & THE MELODIC POLAROIDS, was recorded exactly one year ago this week in Bristol, Virginia, where I have returned to perform at the Rhythm & Roots Reunion. I recorded the whole album DIRECT TO LACQUER, truly old school, i.e. quickly and inexpensively, and with minimal fuss. When it was finished I released it on the internet and through some independent record stores. I set up pre-orders from my mailing list and sold it on the road. I did not hire a publicist. I did not dole out the money for a radio campaign. I only spent money on the manufacturing of vinyl, posters, shirts, hats, and CDs, plus art direction and postage. As it happens, this solo acoustic album is the first truly independent project where I’ve been able to actually do more than break even. Playing shows and selling merchandise is and has been my main source of income for the last 20 years, and sometimes it has been a struggle to make ends meet. After the record label and publishing deals went away, I returned to releasing albums on my own label, like I did with my first album, Special 20, all those years ago. Today, I own five albums worth of original material and would love to place more songs in film and television and score more films as I have done in the past. This is me asking out loud to find that work, for I feel strongly that every shot I don’t take won’t go in the goal. I have the tracks and the track record. If you pre-ordered or purchased this current record from me, I thank you for helping me survive in the troubadour business. I have performed EIGHTY shows in 2018 so far, and I have around 30 more to do-including several in Europe-before wrapping it up in December, traveling to Okemah, Oklahoma to record my next album in a pop-up studio, and starting the whole process all over again. The traveling life is difficult on the body and family life, so I am always looking for more reasons to stay in Nashville for work. And by work, I mean co-writing, producing, and recording music. I thank all those publicists, radio people, and soulful music business folks who helped me get as far as I have. I hope to work with you again someday. There are a lot of fun projects in the works for 2019 and beyond, and CAMPFIRE PROPAGANDA RECORDS & BOOKS thanks you for your support. THANKS ALL THOSE WHO ATTENDED THE CAMPFIRE PROPAGANDA AMERICANA FEST DAY PARTY. IT WAS A BLAST! Thanks for contemplating a HOUSE CONCERT in 2019. Write me if you are thinking about it. 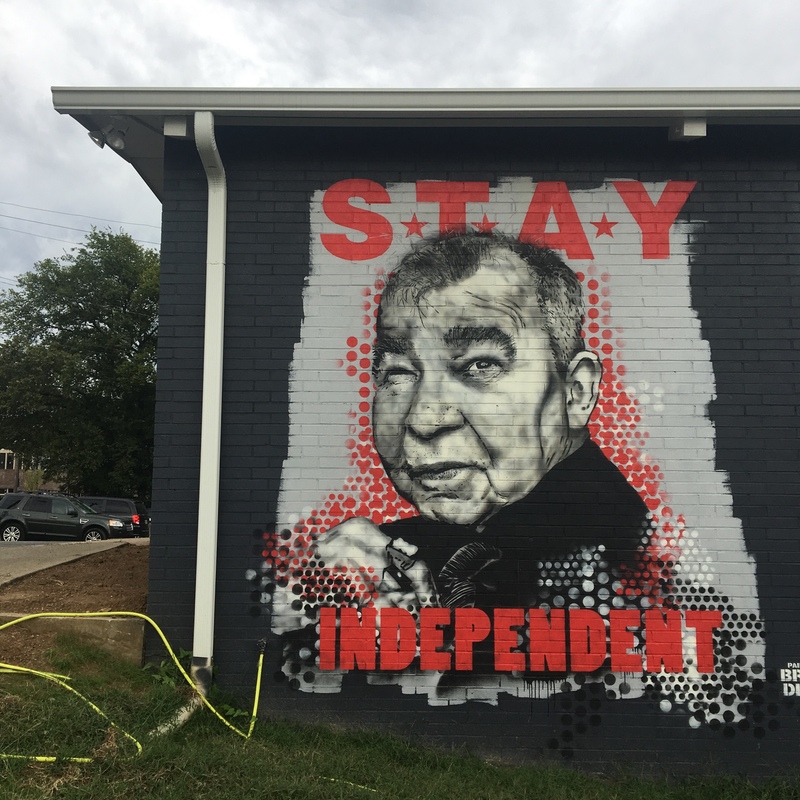 PHOTO is of a mural of JOHN PRINE at the new GRIMEY’S RECORDS in EAST NASHVILLE. Talk about following your independent heart! Here’s to a great record store moving to a new location. Support them. Tim Easton, in Bristol, Virginia today.